"Depending on how you want to load up the bike, it truly is a versatile bike..."
About the front end handling: "slightly more bias to the stable side, but still fairly playful..."
"...when I was descending, even on rough stuff, I was able to keep the bike pointed in the direction I wanted it to go." "One of my biggest likes was actually the handling. It rode fairly neutral but felt springy." "A cool mix of modern components...and retro touches that actually add to the ride feel of the bike." "Awesome for bike commuting and touring..."
Be sure to watch the whole video for the full take! You can also find the full build list right here. We're going to be closed Monday, September 3rd in observance of our Labor Day Holiday. Orders placed over the holiday weekend will go out on Tuesday. If you need your order to leave before the weekend, make sure you place it before 2pm ET on Friday, August 31st. Randonneur and Transporteur Bags Restock with FAQs! We just received a nice restock of our popular Randonneur, Transporteur, and Snapper Bags in Burgundy, Teal, and Black. 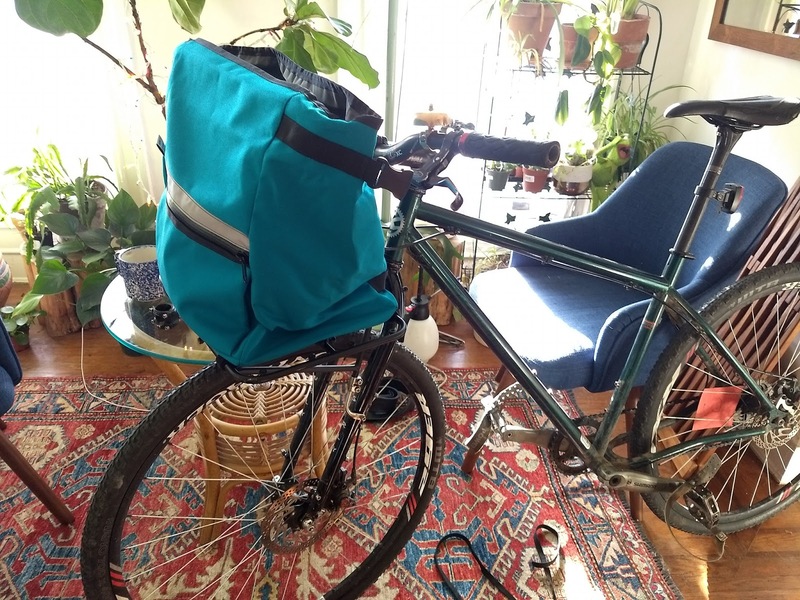 Can I use the Randonneur Bag without a decaleur? In theory yes, but you'll need a rack at least as wide if not wider than the bag's footprint: 27x19.5cm. 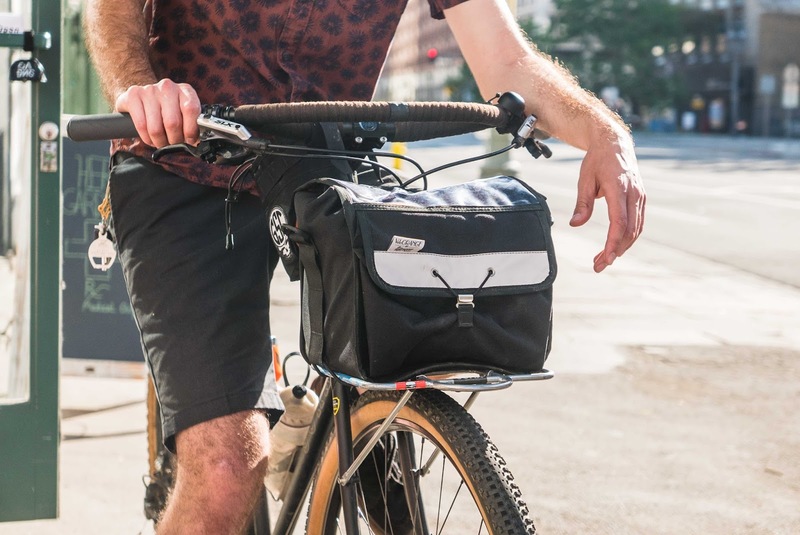 We designed the bag to work perfectly with our Randonneur and Campeur Racks, so that is what we suggest for an ideal setup. 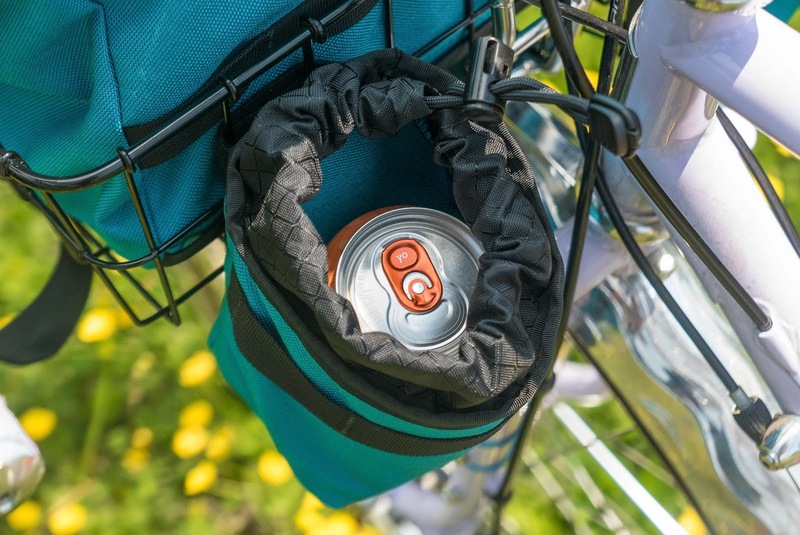 Does the Transporteur fit on the Surly 24-Pack Rack? Yes. You'll need to arrange the movable velcro straps to really cinch it down, but it works great. Is the Randonneur Bag waterproof? The Cordura outer layer and a truck tarp liner makes for a waterproof combination, but the entire bag cannot be thought of as waterproof as it has a lid. It isn't a dry bag. 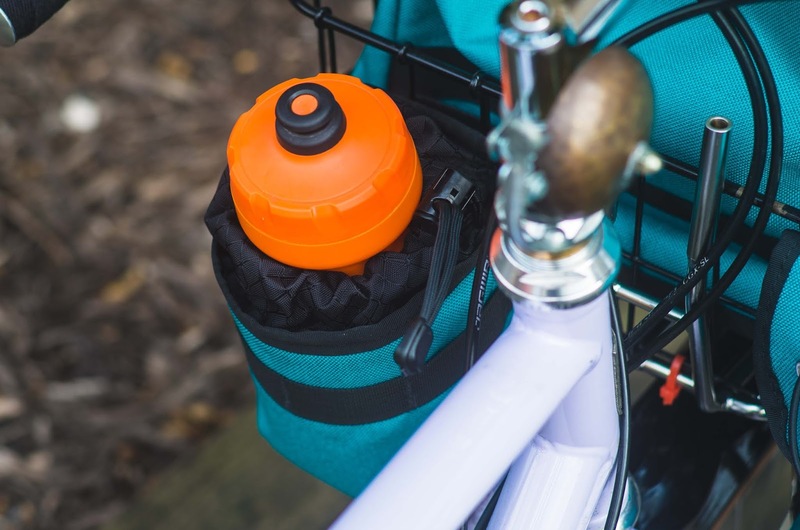 For our purposes as bike riders, you can safely store things inside the main compartment and be confident that they will be dry. Though, if you open the bag up during a storm, things get wet, obviously. Is the Transporteur Bag waterproof? When the top is rolled down snugly, it is waterproof. Both bags include a simple shoulder strap for off-the-bike fashion shows. What's the largest camera that fits in the Snapper Sack? Largest? A mirrorless camera with a pancake lens is probably the biggest. I use a Lumix LX100 as my everyday camera and it is based (loosely) off those proportions. The bag is roughly 16cm deep and 8.5cm across, so take that for what it's worth. Anything bigger and I'd suggest putting it inside the main compartment of the Randonneur Bag. It's also a great fit for SLR lenses! Can I fit a waterbottle in the Snapper Sack? You sure can. 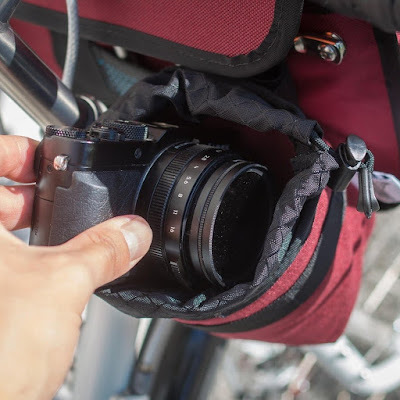 It makes a great additional bottle location for smaller sized frames and those using frame bags that take up prime main triangle space. Drink up! Do the Snapper Sack and Cell Phone Pockets work on Wald style baskets? Whether it's road conditions, poor weather, injury, or even simply getting lost, self-sufficient tours rarely go 100% as planned. But we persevere. We push through those tough spots where we second-guess ourselves and that is where we learn to be exceptionally resourceful - cleverly solving problems to get back on the road and continue exploring. This is not one of those stories. Starting out of Taipei along my two local companions, Kist and Black, we were feeling really good. The weather was comfortable and we kept a nice pace. We left town and started for the mountains. The road got progressively steeper until we were riding what we could and walking what we couldn't. We got deeper and higher, with no downhill respite. I have loads of experience hike-a-bike'n, so I understand that at a certain point, walking is simply more efficient than standing on the pedals, especially loaded. Don't let your ego get the best of you. Sometimes it's ok to walk. As noon came and went, the sun and humidity started to become increasingly oppressive. It would have been fine riding and allowing our epidermis to cool down our bodies through the efficient production and utilization of sweat, but when you're walking uphill at a crawl, your body can't do diddly squat. 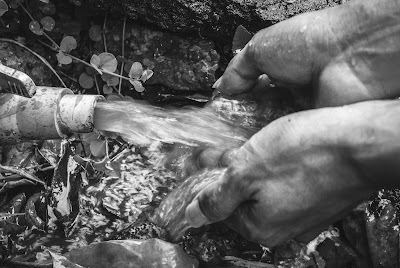 We simply couldn't drink enough water to compensate that which we sweat out. We eventually found a local resident who kindly gave us enough water to fill our bidons. Once sufficiently hydrated, my compatriots turned back as they only took the day off for our ride. Thanks for the wonderful company, guys! Continuing up the mountain, the pavement turned to unmaintained concrete, which turned into gravel. The gravel faded, and full-on rough and tumble dirt and rocky trails were left. The trail I was supposed to take simply became a loop leading me back to familiar roots, obstacles, and views. A loop with stunning views and fun riding, but a loop nonetheless. The other trail simply stopped with a guardrail overlooking a cliff. And the third, very tiny trail had long been swallowed back up by nature. So here was my dilemma: the original plan was now completely shot. There were no other routes to traverse the mountain, but there was one option that was definitely earned - descend. 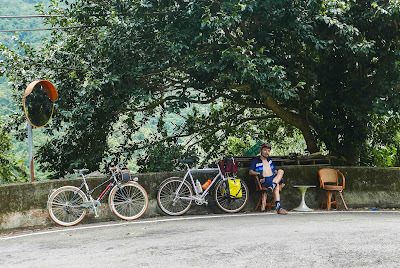 The original plan was to ride through the country, into the mountains, and descend via gravel and forest roads stopping in small villages for supply restocking, ultimately reaching Taroko Gorge. Simple, right? That plan was abandoned. Instead I made a route to the hot spring town of Wulai to regain some energy both physically and spiritually. 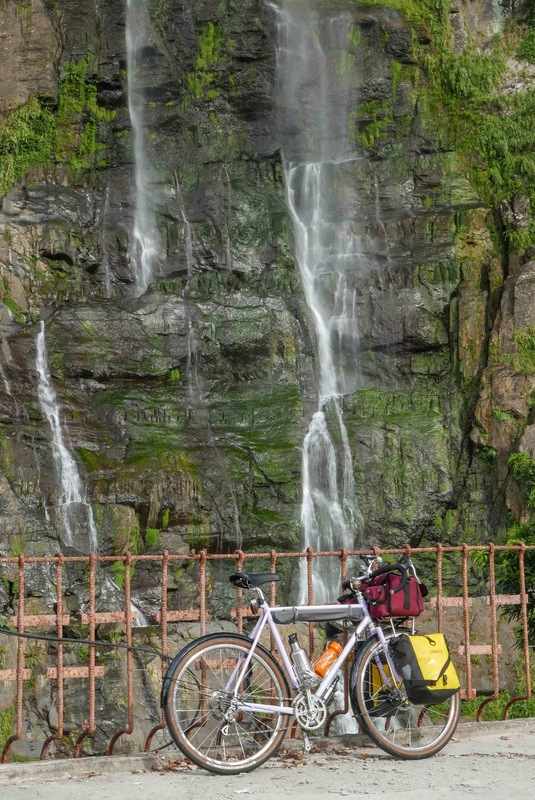 There is a beautiful waterfall which is the centerpiece of the town. If you go a bit further down the road, past the shops, through a couple tunnels, you can do a bit of hiking which takes you to a smaller waterfall that many locals and visitors go to for tea and relaxation. I joined several locals for a good foot dip in the cold mountain water. Without sounding egotistical, I'd consider myself a strong rider. 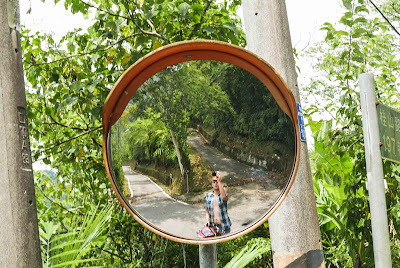 I'm a seasoned tourist, I trained (as much as I have for other tours), have plenty of experience with gear, and am comfortable conversing with foreign locals for help (often involving charades), but frankly, the landscape tamed me. No scratch that. The landscape spanked me. At the top of the mountain, with the only option in front of me being going back from whence I came, I felt absolutely defeated. For all intents and purposes, my tour had failed. My original plan was in the bin and I felt physically deflated. Maybe if I had gone back and taken another way around on main roads - it would have only added about 75km - I might have gotten back to the correct route. But there was no way. I was dehydrated, my muscles were tightening, and I was contemplating how continuing on could affect my family if anything happened to me (a bit dramatic, but those are the thoughts that cross your mind). After a couple days at Wulai enjoying the natural springs, I headed back to Taipei to catch an early flight home. As I headed out onto local roads, the sky opened up for me, graciously, in the form of rain. 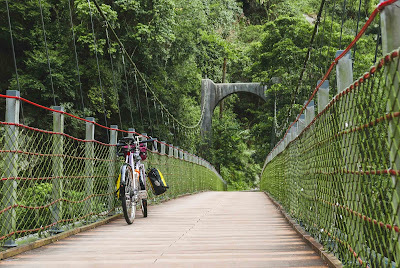 The rains subsided and made the atmosphere even more humid as I entered the city limits and welcomed those familiar river bike routes that I am so fond of. And you KNOW I'm gonna hit a pump track on my touring bike. It's the little things, right? Up at the top of that mountain, as the sun was temporarily blocked out by puffy clouds, I realized I'm not doing this to win a contest. I'm not doing this because I have to. I'm doing this for fun. Potentially injuring myself is not fun. It isn't epic. It isn't rad. I get that some hilarious stories come from tough spots, but they often aren't threatening bodily harm. As someone who creates content (among the other hats I wear at VO), you need to show your super-human side. Things slide off your back, you don't get flustered, and you definitely don't fail. But you know what? I am only human. A failed tour (and failure in general) should never be looked at negatively. You should understand that you put yourself out there, something didn't work, and now you have the wisdom and strength to know what to do in the future - that's growth. And while this particular tour wasn't meant to be, I'm already looking forward to the next one equipped with a better grasp of my limits, understanding of resourcefulness, and more water capacity.